IS THAT PRETTY GEM LYING TO YOU? Is it aquamarine? Is it tourmaline? Sapphire? Nope, these bright blue crystals are apatite. This phosphate of calcium mineral's name comes from the Greek and means "cheat" or "I am misleading". 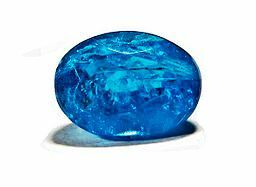 Apatite comes in bright blue, as well as green, yellow, pink purple clear and even in a cat's eye version. 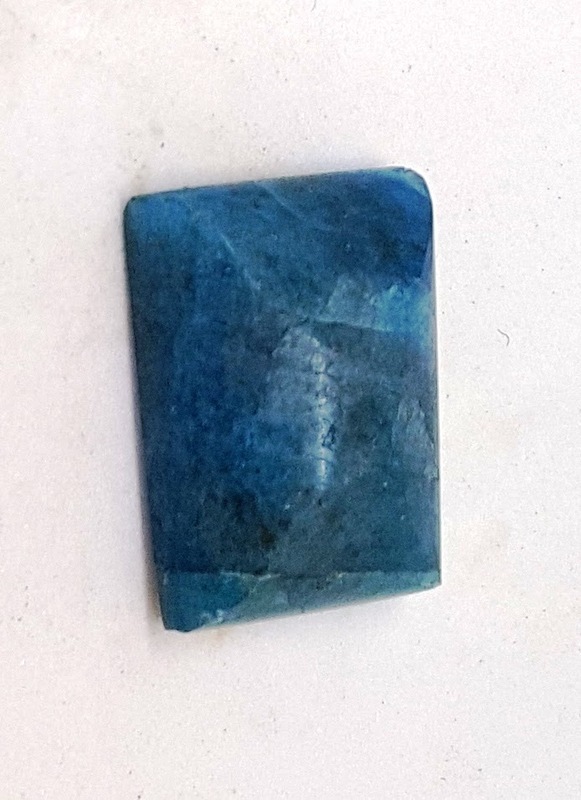 If you are purchasing apatite, be aware that sometimes, especially for the blue and green stones, it has been heat-treated to enhance the colors. Be sure to ask the vendor about whether the stone has been heat-treated or otherwise enhanced. This incredible blue apatite has been faceted and I love the way it plays with light. HAVING AN APATITE OF MY OWN! 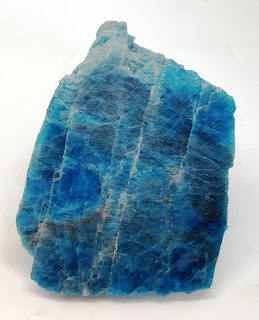 When I was in Arizona for the rock shows this past winter, I saw this huge shipping crate filled with blue apatite that was sparkling in the bright sunlight--so I bought some. This is what I got. It's obviously not as gemmy as the faceted piece above. In fact, it looks a bit like a whole bunch of the crystals like the specimen at the top got squished together. That said, I had high hopes when I started working on it. I found it a bit unstable on the long upward lines, but not always. This is a blow-up of the first small cab I made with this material. I'm pretty disappointed with it. I knew the color would be uneven, but I'd hoped it would take a polish, or at least a luster. I'll be trying another piece of it later, but first I'm going to stabilize it and see if that will give me a better result. 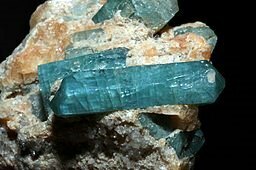 At about 5 on the Mohs Scale, you'll be able to work apatite fairly quickly, say compared to quartz. Some of it can be a bit brittle, and if you think yours may be, take the time to stabilize it before you cut or grind so you won't have bits flying off and ruining your cabochon. 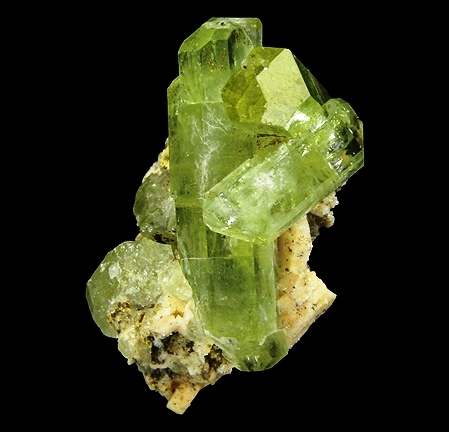 The color of this specimen of green apatite makes me think of peridot.It's so gemmy that it could probably be faceted. When I first saw these earrings at a street festival, I wondered how they could sell emeralds in a place like that! 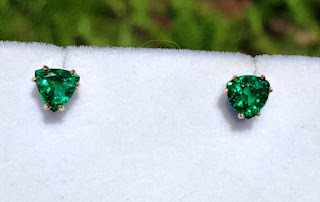 One look at the price and I was convinced they weren't emeralds, in fact, they were quite affordable--so I bought them! I've been delighted to produce a new blog post every other week for the last 19 months. Demands on my time will force me to cut back to once a month for right now. I hope you'll continue to look for www.LapidaryWhisperer.com the first week of the month.